Caramel Potatoes » Valentine’s Day Raclette Grill Giveaway! Have you seen these amazing contraptions known as a Raclette Grill? They seem to be all the rage lately. I keep seeing them pop up all over the place. I was first introduced to the wonderful world of Raclette a couple of years ago when we were visiting my sister-in-law and her family. It was one of the best discoveries of my lifetime. (I am THAT into cheese.) Lucky for me my hubby bought me one of my very own for my birthday last year. 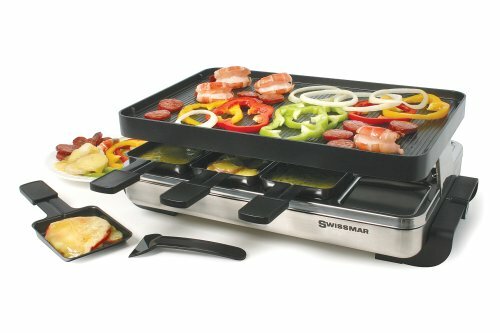 The Raclette grill is fun for the whole family, as a couple or an at home group date night. We love getting together with friends for a Raclette party. So what exactly is a Raclette Grill? The first thing you should know is that Raclette is a type of cheese. Now I could get all technical on you and inform you that Raclette is a Semi-hard cheese that has a very distinctive pleasant, aromatic smell with a creamy texture, similar to Gruyere cheeses, which does not separate even when melted. The flavour can vary from nutty, slightly acidic to milky. I could even tell you that traditionally it is served with small potatoes, gherkins, pickled onions and air dried meat called Viande des Grisons. However, really all you need to know is that it is delicious and just writing about it makes me want to run to the store and buy some for dinner tonight. Some of the vegetables need to be steamed or boiled first, it just helps move things along a little quicker. The nice thing is you can do all that ahead of time, because you can warm them on the grill before eating. Obviously when we enjoy Raclette as a family we stick to our favorites or what we happen to have on hand that day. Another great feature that I love is that the grill top flips over and is perfect for making Crepes. Since we are coming up on Valentine’s Day either these Red Velvet Crepes or Chocolate Crepes would be great for dessert after your finished with your Raclette Dinner. Don’t you think? We love this grill year round really, but how perfect would this be for Valentine’s Day. **Must have an US mailing address. Good Luck; this giveaway will close on Sunday, February 9th at 10:00 pm CST. Wow! This looks awesome! I would love to have one! We loved and used our Raclette Grill all the time when we lived overseas! It is such a great idea and the food is super yummy! We loved to entertain as it was a great conversation piece! This is perfect to enjoy with friends in parities. My mouth started watering just by your simple descriptions of cheese! what a cool little grill …would love to win it! Love the looks of this grill. Would love. Thanks. Looks amazing. Would love to try one out. Maybe with crepes first. Have never used one so would love the opportunity! I follow you on FB, Pinterest, and Twitter. Thanks. This party grill sounds amazing! I would love to win it! I follow caramel potatoes on pinterest! This looks like it would be fun to use! What a fun idea to do with family and friends. Thanks for the chance to win. This sounds delightfully yummy! I’m following you on Pinterest! i would really love one of these! This grill looks amazing for a party night! Wow – this would be so fun for the whole family on family night. … one of the few times we all get together!! I want to win! This grill looks amazing!!! Oh my! This looks like so much fun for date night or family night!! Looks like a neat grill and a great gift fto share with my daughter-in-law who is becoming a gourmet cook! Love raclette! Follow caramel potatoes! What an awesome prize! My family would love this. That looks like tons of delicious fun!I want one! I think that a variation of a Philly cheese steak may be coming with this grill! I’d love to have one of these. With feet of snow in our yard, we cannot easily access our grill this winter! This grill looks very convenient. Thanks! Wow I have never heard of this cheese before but we all love cheese and this grill sounds perfect for enjoying it with! This looks awesome! I have so many things in mind that I could make with it. Yummy! We love cheese in my house… this would be great to have. Ohh I would love to have one of these! How awesome this would be to have for family get togethers, or heck, just when I want to grill inside woot! wootw! The grill looks great for my family. I really enjoy your site! What I love most is mom/daughter team…I miss my mom please continue to enjoy each other! Going to a Raclette restaurant is one of my favorite memories of a long ago trip to Switzerland. What a great conversation hub for a diner party! Please please this sounds so wonderful. I love your web site and I am on your e-mail auto list. I have made many recipes from your web site. Thanks. I absolutely love cheese too sounds so interesting. Thanks for all your hard work getting us recipes that are so delicious. I could make a lot of healthy dishes with this prize! A grill for cheese?!? My mind is blown! I love it! Never heard of this grill before! Sounds just marvelous! Love to win and master this grill! I had not heard about this grill before your giveaway but, after reading your post and following the Amazon link, I am totally intrigued. Thank you for this giveaway! That is nice. I would love to have a grill like that! I had never heard of this before reading your Pinterest post. It sounds amazing! I’ve also liked you on Facebook and shared the post. Thanks for the fun contest! This sounds awesome. My family is trying to eat healthier and find fun ways to prepare meals. I would love to have this grill because it is my favorite way to prepare my vegetables. Ohh. I have a good friend who has one of these. I love it! You’re right- they’re so great for parties. Love your site! This grill looks fantastic! this would be perfect for my new years eve party! I would love to win this to cook a meal on Valentine’s day. This grill looks like an amazing way to make a multiple part meal (fajitas, burgers your way, etc). It also could be a lot of fun putting the meal together with the kiddos. This looks like a versatile little tabletop grill. Oh,This is wonderful…please throw my name in the hat!!! I would love to win this for my husband. He would love it. This looks like it would be really neat to use. I’m getting hungry just thinking about cooking on this! Would love to cook on this!! All of the pics and recipes look so good. Ive never heard of that cheese – sounds yummy!